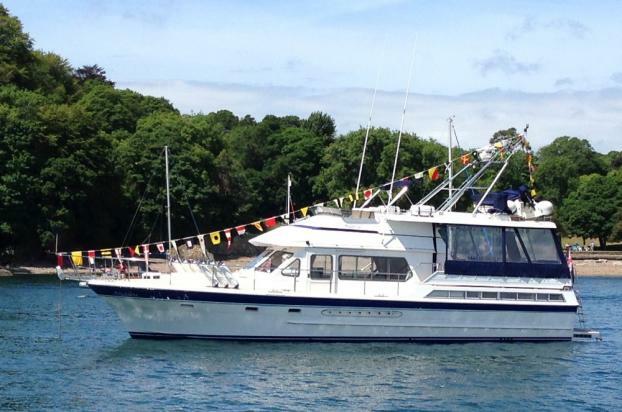 Malibu is an extremely well presented example of the Trader 54 Sunliner. This boat has had many recent updates and has recently been polished, antifouled ready for the season. Domestic and service battery condition indicators. Holding tank installed but not connected. Forward cabin with queen size island berth, wardrobes to either side. En-suite head with sea toilet and seperate shower cubicle. Guest cabin to port with twin bunks and hanging locker. Stylish and comfortable saloon with dinette which converts to a double berth, settee, minibar and entertainment cabinet opposite with TV, VCR and Hi-Fi with CD changer. Large chart table to port, internal helm opposite with wheel and full instrumentation. Small utility room to port with plenty of storage and concealed hotel type safe. Spacious aft stateroom with king size double bed, vanity unit, wardrobes and plenty of stowage. En-suite head with sea toilet and dedicated shower compartment. Sheltered aft deck with lounge/dining area, storage lockers and easy access to bathing platform. Sailor SSB radio - not in commission. Window sun covers - mesh type. Flybridge with seating and helm position, private sunbathing area aft. Integrated bathing platform with folding ladder. Hull Polished - May 2015. Stern gear polished - May 2015.